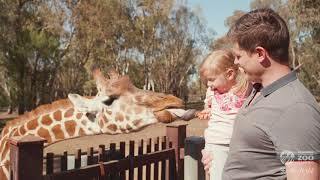 Wake up in the wild at Billabong Camp in Dubbo, Taronga Western Plains Zoo's overnight camping experience, where you will discover the magic of this 300 hectare open range zoo in a whole new way! Billabong Camp offers an immersive bush camping experience within the zoo's Australian wildlife area, with accommodation in 3 x 3 metre canvas tents (already set up for you) located around a picturesque billabong. Guests experience guided behind-the-scenes tours as well as close encounters with some iconic Aussie wildlife. The Billabong Camp package also includes two day zoo admission, meals and more. Billabong Camp is one of three overnight experiences at Taronga Western Plains Zoo, winner of the 2015 Australian Tourism Award for Unique Accommodation.